1. Please give us some general info about you and your event: *This question is required. Today's Date *This question is required. This question requires a valid date format of MM/DD/YYYY. Name (Individual or Organization) *This question is required. Please include setup and cleanup time. Description of Event *This question is required. Estimated Number of Participants: *This question is required. This question requires a valid number format. Will food be served? *This question is required. 2. What space(s) would you like to request? *This question is required. 3. 232 Adult Classroom Usage: *This question is required. If you rearrange the chairs or tables, please return the room to its original setup. No red-colored drinks and please agree to clean up all trash. *This question is required. -- Please Select --Okay, got it! 3. 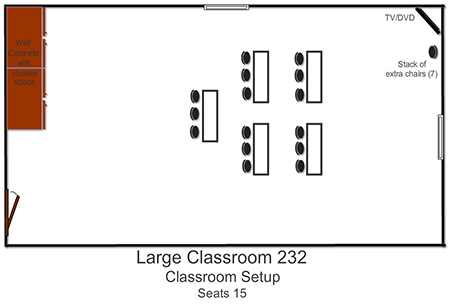 Which setup option would you like in 232 Adult Classroom? *This question is required. Please select one of the following images. 3. 237 Adult Classroom Usage: *This question is required. 3. 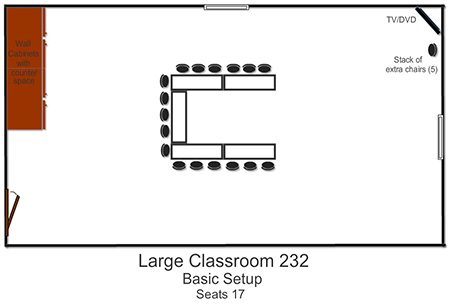 Which setup option would you like for 237 Adult Classroom? *This question is required. Please select one of the following images. 3. Cafe and Library Usage *This question is required. Will you need use of the Kitchen at all? If so, please be sure you've marked the checkbox by Kitchen. *This question is required. 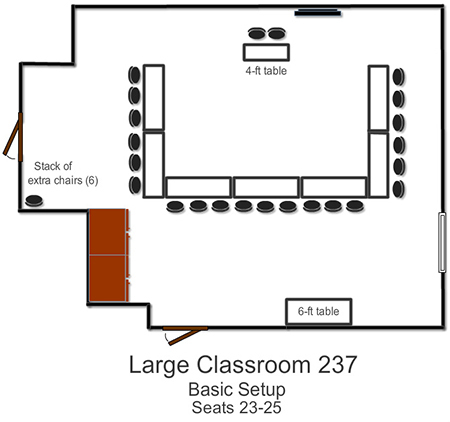 If you rearrange the Cafe and Library chairs or tables, please return the room to its original setup. Please agree to clean up all trash and decorations. *This question is required. 3. Gym Usage: *This question is required. Would you like to use the Men's and/or Women's Showers? *This question is required. 3. What room setup would you like in the Gym? *This question is required. Please select one of the following images. 3. Kitchen Usage: *This question is required. Would you like to use the stove/oven? *This question is required. If so, what hours? *This question is required. Would you like to store items in the refrigerator, freezer or chiller? *This question is required. The Kitchen contains a large chiller (extremely cold and cannot be used for fruit or salad), a side by side refrigerator/freezer, and an upright freezer. Church ministries maintain some ongoing storage so the amount of space available can vary. How much refrigerator/freezer space would you like for your event? Example: "One shelf should be enough." *This question is required. On what date would you like to start bringing food to the Kitchen for storage? *This question is required. This question requires a valid date format of MM/DD/YYYY. 3. Which setup option would you like in the Student Room? *This question is required. Please select one of the following images. 3. Student Room and Student Cafe Usage: *This question is required. Please understand the Student band instruments and equipment are not available for use. Please do not move items on the stage. *This question is required. Please do not rearrange the Student Cafe furniture. No red-colored drinks and please agree to clean up all food and decorations. *This question is required. 3. Auditorium Usage: *This question is required. 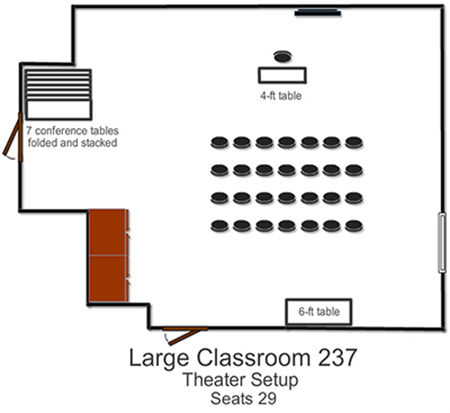 What setup option would you like in the Auditorium? *This question is required. CUSTOMIZED SETUP: Contact Jason Whitehorn at jason@discovergrace.net to request specific tech or setup requests. 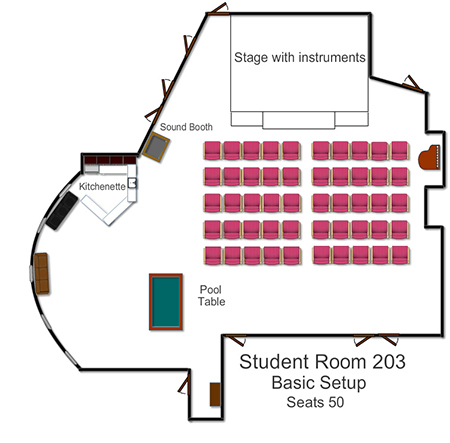 NO FRILLS SETUP: For this setup the auditorium is used for seating only. Please do not move the chairs or stage equipment. Mics, music, sound and video equipment are not available for use. Anyone speaking will need to be close enough to the audience to be heard without a mic. Please do not use outside equipment with this setup option. Lighting will be limited to the overhead fluorescent lights. No decorations are permitted with this setup option. Would you like to request use of the sound system? (Playing any music, using any instruments, need use of a mic etc.) *This question is required. Would you like to request use of the video projection system? (Any videos, powerpoint, keynote, slides etc.) *This question is required. Will you like to request the use of stage lighting? (Standard setup includes fluorescent house lighting, however we have colored and enhanced white stage lighting available.) *This question is required. Please do not rearrange the Auditorium chairs, no red-colored drinks and please agree to clean up all trash. *This question is required. 3. 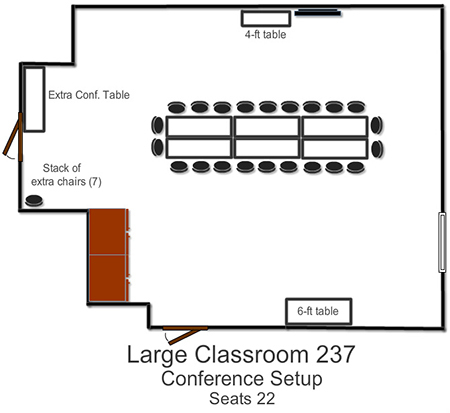 The room rental charge includes the use of tables and chairs based on room capacity. 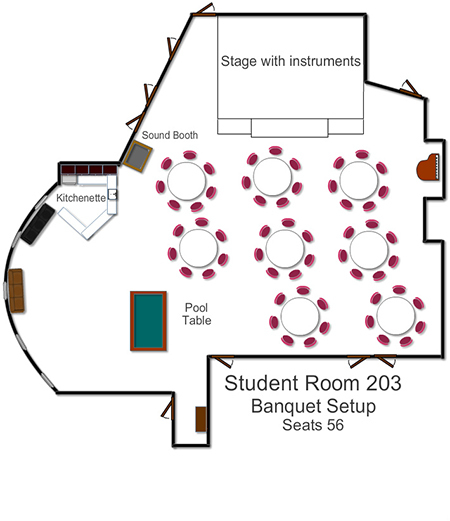 Would you like to request the use of additional tables or chairs in a room(s)? *This question is required. 4. How many 8-foot rectangular tables would you like to request? (Choose between 1-12 tables.) This question requires a valid number format. 4. How many 6-foot rectangular tables would you like to request? (Choose between 1-10 tables.) This question requires a valid number format. 4. How many 60-inch round tables would you like to request? 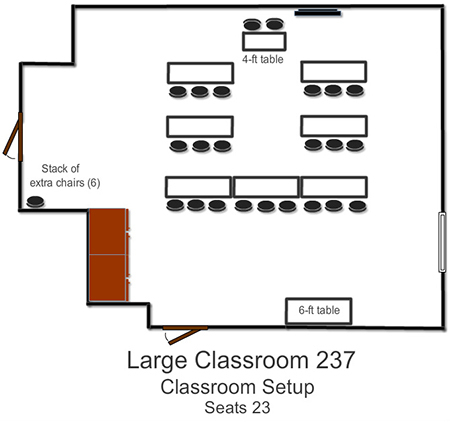 (Choose between 1-24 tables.) This question requires a valid number format. 4. How many brown folding chairs would you like to request? (Choose between 1-150 chairs.) This question requires a valid number format. 4. Where would you like the additional table(s) and/or chair(s)? *This question is required. Comments about table and/or chair placement Please enter an 'other' value for this selection. 4. FEES FOR FACILITY USAGE: A fee schedule for basic use is listed by room. Fees are based on hourly or daily use with times including setup and cleanup. Additional fees may be charged at the discretion of Grace Church taking into account factors such as special setup requirements, number of participants, use of any special equipment, food and drink, etc. Individuals and organizations assume the responsibility for repair or replacement of any damages caused to the grounds, facilities, furnishings or equipment. If damage does occur, communication of damage must be made to Grace Church. *This question is required. PLEASE ACKNOWLEDGE YOUR UNDERSTANDING OF THE FEES INVOLVED BY CHECKING THE BOX NEXT TO THE ROOM(S) OR SERVICE(S) YOU ARE REQUESTING. *Room fees are discounted 50% for ministry partners (members) and partner organizations. Fees are not completely waived as there are costs incurred anytime the facility is used (increased utilities, cleaning, normal wear, etc). I understand checking the boxes below constitutes a legal signature confirming I acknowledge and agree to each statement. (The Facility Use Guide can be found on our website discovergrace.net ) *This question is required. I understand additional fees may be charged at the discretion of Grace Church based on my event requests. *This question is required. I have read over the Facility Use Guide and agree to abide by the rules and regulations stated therein. *This question is required. I agree not to hold Grace Church responsible for any injury or violation to person or property involved with our event. *This question is required. I agree to pay a deposit (50% of the total cost for using the facilities), and I understand all or a portion of the deposit may be withheld as a fee for cancellation. The remainder of the cost is due prior to the event. I agree to visit the Grace Church office during business hours to arrange for payment for my event. *This question is required. I agree and I understand. I understand a Grace Church team member will evaluate my request and notify me if it is approved or not approved. *This question is required.